The released footage from a dash cam sheds new light on Michael Slager and Walter Scott's interactions in what happened before moments before North Charleston police officer Slager fatally shot Scott in the back on Saturday, following a traffic stop. Although the dash cam footage released Thursday by the South Carolina Law Enforcement Division does not show the alleged struggle for the officer’s Taser nor the shooting itself, it does show the exchange between the officer and Scott, after Slager stopped Scott because of a broken taillight. The four-and-a-half minute clip shows Slager pulling in behind Scott’s Mercedes-Benz in a parking lot and then approaching the vehicle. In what seems to be a routine stop, the officer asks Scott for his license and registration. Scott then says that he does not have either registration or insurance for the car because he is currently in the process of purchasing the car. They talk for a little bit, and then Slager returns to his cruiser. Then, Scott opens the door, and Slager tells him to stay in the car. He does, briefly, and then the dash cam shows the driver’s side door of the Mercedes open, and Scott starts running. The passenger in Scott’s car appears to remain inside the vehicle. According to CNN, the other passenger was Scott’s coworker, who police detained and placed inside a police car. The officer then chases after Scott, and both disappear from the dash cam’s view. While the video does not show critical points of the exchange between Slager and Scott, it does show something important. The Chicago Tribune points out that Scott showed no indications of either verbal or physical threats in his interactions with Slager before he bolted. The next moments — those not captured by the dash cam — are apparently the moments in which everything escalated, resulting in Slager allegedly shooting Scott eight times in the back before Scott died. Apparently, the officer caught up with Scott as he was running away and, according to a bystander, there was some sort of a confrontation between Slager and Scott. The officer alleged that there was a struggle for his Taser. 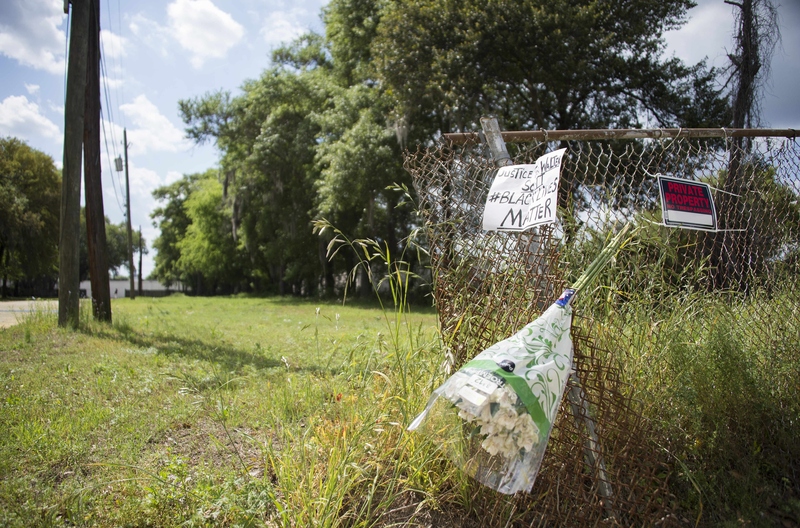 The bystander who noticed the struggle caught the last moments of the incident on tape — the moments in which Scott was once again running away, and in which Slager allegedly fired eight shots in Scott’s back. Slager has been charged with murder and has been fired from the police force. He is being held without bond until his Aug. 21 hearing. Slager could face 30 years to life if he is convicted of the murder charge.